Curd rice which is popularly known as Thayir sadam in Indian states of Karnataka, Tamil nadu and Kerala is a one pot rice dish tempered with spices . 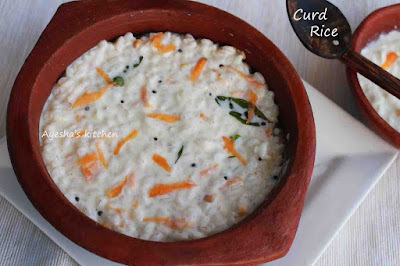 This special rice yogurt recipe is very simple to make and is mostly accompanied with South Indian pickles. A perfect dish which aid to easy digestion and is considered as the best for kids lunch meal. There are lots of variations in the preparation of this yogurt rice / curd rice. The variation mostly depends upon the seasoning of this rice recipe. The seasoning ranges from grated carrot to pomegranate seeds, raisins, fried cashews or like so. Here i used the carrot slices as the additional ingredient. 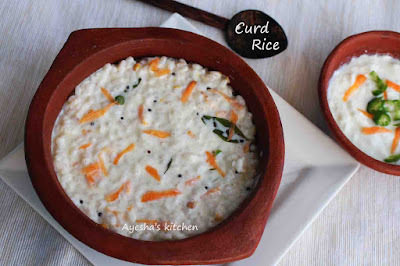 You can serve this curd rice chilled or lukewarm. Hope you all give this simple healthy rice recipe / dahi chawal / thayir sadam a try, which is one of the best comfort foods during summer. As the intake of yogurt or curd helps to reduce our body temperature, it is served after a delectable meal to balance the heat. And moreover this is the best way to make use of leftover rice effectively and quickly. Here is the recipe showing how to make thayir sadam / yogurt rice / curd rice / rice yogurt / indian vegetarian recipes / simple indian recipes /brown rice recipes. Take the cooked rice (cooled) in a large bowl. ( Normally white rice is used for making curd rice / thayir sadam. But here i used brown rice / matta rice, the best way to include brown rice in our diet). To this, add fresh curd / yogurt and combine well with the cooked rice. ( Some people mash the cooked rice before adding the curd, but i never prefer so. All you need is, the rice must be little mushy. You can also add little milk if the curd is more sour. ) Add more or less curd as per the consistency needed. Now heat a pan with little oil and saute all the ingredients for seasoning. Add this seasoning to the curd rice and check for salt. Stir well and serve along with pickle or stir fried veggies.